How a mousepad is designed is generally not complicated, and the Cooler Master MasterAccessory MP750-L is no different. It does not feature the double sided capabilities that the Cooler Master MasterAccessory MP860 had. 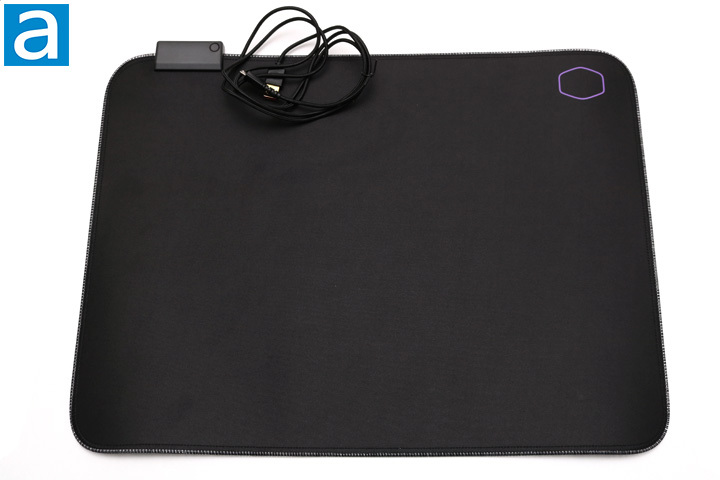 However, the MP750-L is a cloth mouspad and is flexible as a result. I was quite curious as to how Cooler Master accomplished a flexible LED mousepad. 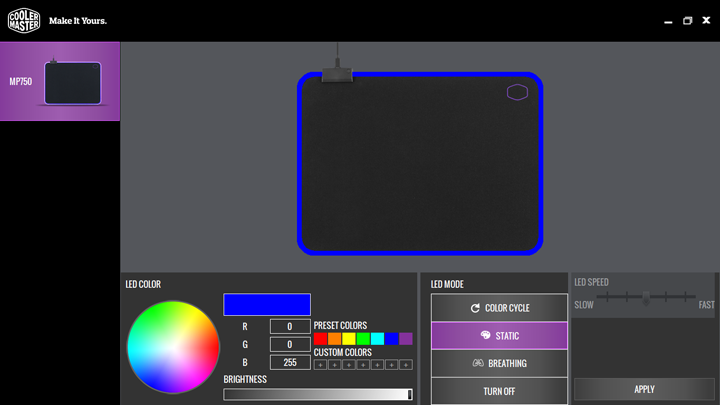 The RGB LEDs surround the cloth mousepad and are sewed on by some thread about every 0.5 mm. The many but spaced out threads ensure the color comes through fully and that the LED will not just come loose. I am quite confident in the build quality, but I see the issue with the LED potentially being able to come loose over time. The threads are really thin and so could break. However, they are strong and there are plenty of them. The RGB controller is found in the top left. It is small plastic piece where the micro USB cable gets plugged in and it has a button to cycle through different colors. There is also software to download which allows even further customization. The rest of the Cooler Master MasterAccessory MP750-L is rather basic. A minimalist Cooler Master logo is found in the top right. The purple ring looks excellent with the rest of the mousepad, and for the most part, blends in if you are not looking for it. One complaint of the Cooler Master MasterAccessory MP860 was that it was not big enough and not flexible. The MP750-L addresses both of those issues. The dimensions measure 470 mm in width, 350 mm in depth, and 3 mm in height, which is rather big. The weight reflects the size, and it comes in at 643g including the cable. There are two other sizes to choose from when it comes to the MasterAccessory MP750 series: Medium and extra large. The medium one is only about a 100 mm smaller for the width and depth, while the extra large one is about 500 mm larger in width but only about 30 mm bigger in depth compared to the one we have. The extra large one seems to be like one of those desk sized mousepads. What each of the sizes have in common are the materials used for them, which I cover in the next section. To get an up close image of the microscopic mesh used for the Cooler Master MasterAccessory MP750-L, I placed it in a scanner and scanned it at 1200 DPI. The above picture is just a section of the entire mousepad, but it demonstrates the uniformity found throughout. The uniformity ensures that you will have a smooth experience. At no point should there be any bumps or loose threads for the mouse to catch on. The Cooler Master MasterAccessory MP750-L achieves this by having no discernible imperfections on the surface. Furthermore, the mousepad has a water resistant coating, which should help quite a bit for smaller drops or little spills. The disadvantage of a cloth surface is that it will accumulate dust and dirt over time. Some cloth mousepads can be cleaned easier than others, but the RGB LEDs of the MP750-L makes it a bit more challenging depending on the method used. The larger the mousepad the heavier they are, and most of the weight is a result of the rubber backing. The Cooler Master MasterAccessory MP750-L is no different. 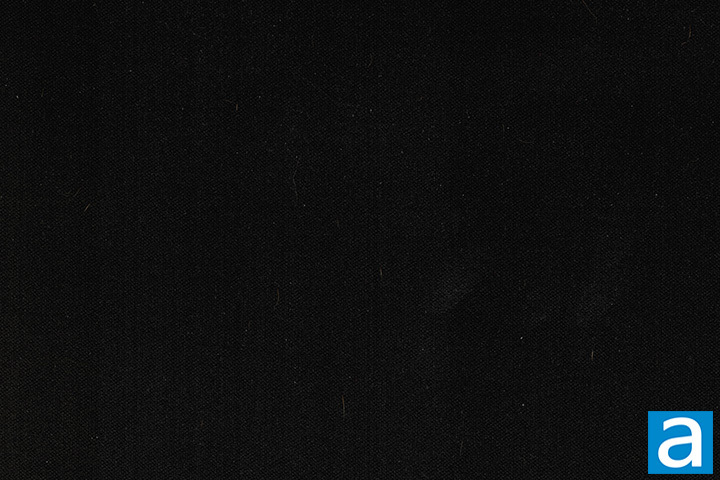 Above is a close up image of the rubber side, which again was scanned at 1200 DPI. As you can see, the rubber is designed with a zig-zag pattern. This ensures the mousepad stays in place throughout use. The pattern is found throughout the back, and again I could find no imperfections. Small imperfections on this side of the mousepad will not make too much a difference either, since it is only gripping the desk or surface it is on, and there needs to be bigger damage for that use to be impeded. The software is the exact same as the Cooler Master MasterAccessory MP860, however the MP750-L does not have as many LEDs. When you customize the LEDs on the MP750-L, you can only select one color at a time. I appreciate that Cooler Master has provided a color wheel, so that the user can take advantage of all the RGB colors. There are only three different lighting effects: Static, breathing, and cycle. Each of them look great, while the brightness and speed of the different effects can be adjusted within the software as well. The LEDs themselves are bright and effectively represent the different colors that can be chosen. Overall, the software is basic and easy to use. There is nothing confusing and I encountered no bugs or difficulties throughout my use. posted 5 minutes ago, with 8 posts. posted 6 minutes ago, with 9 posts. posted 5 hours and 54 minutes ago, with 1 posts. posted 5 hours and 55 minutes ago, with 2 posts. posted 5 hours and 55 minutes ago, with 7 posts. posted 5 hours and 59 minutes ago, with 15 posts. posted 5 hours and 59 minutes ago, with 59 posts. posted 6 hours ago, with 14 posts.